Music Accessories for sale at Lamp House Music, Haddington. Available to buy over the counter, we sell good quality Music Accessories at great prices. Also saving you the time and expense of travelling into the city! 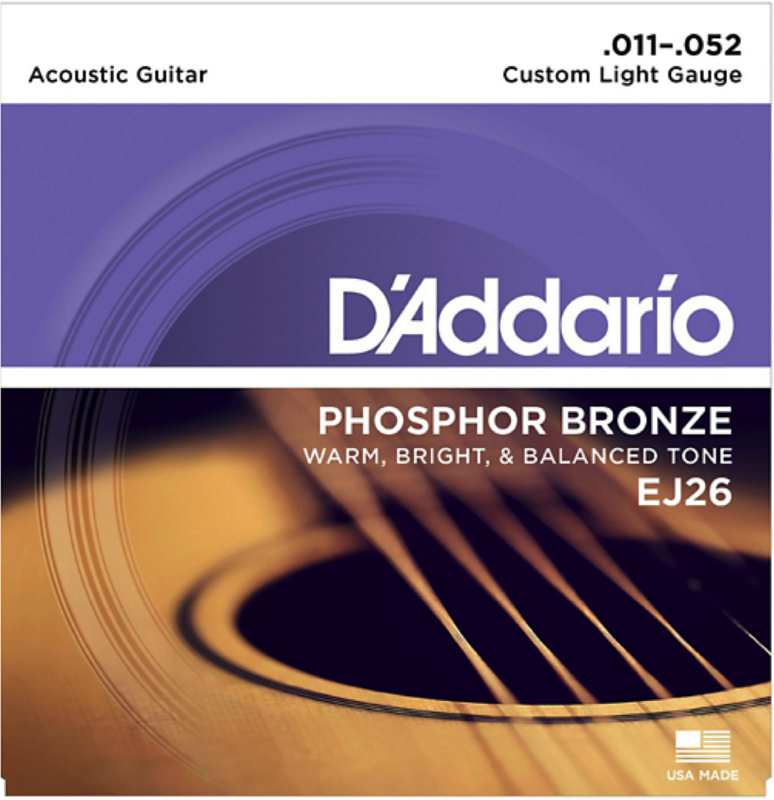 Acclaimed worldwide for their great, long-lasting tone – D’Addario Phosphor Bronze Acoustic Guitar strings have become synonymous with their warm acoustic tone. 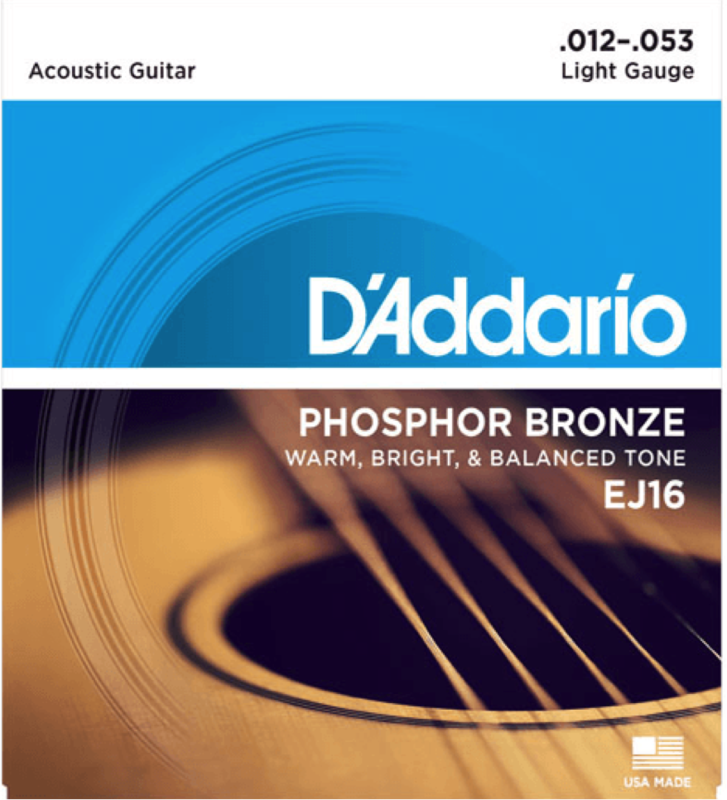 D’Addario Phosphor Bronze Acoustic Guitar strings are acclaimed worldwide for their great, long-lasting tone. 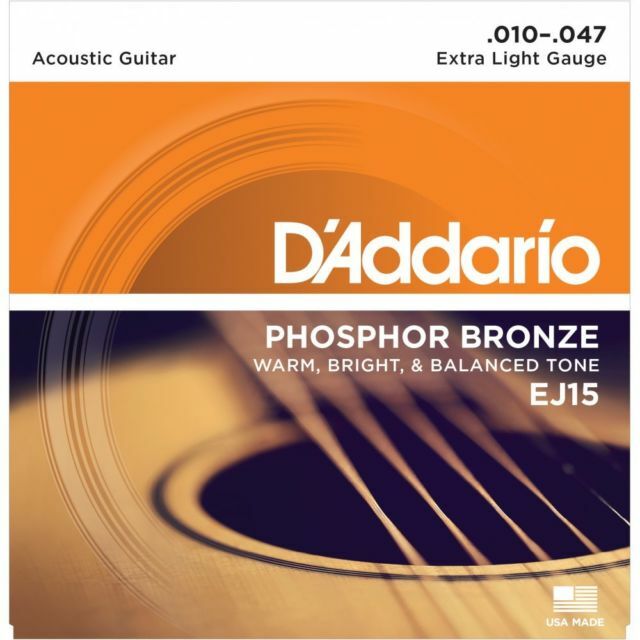 Phosphor Bronze was introduced to string making by D’Addario in 1974 and has become synonymous with warm acoustic tone. 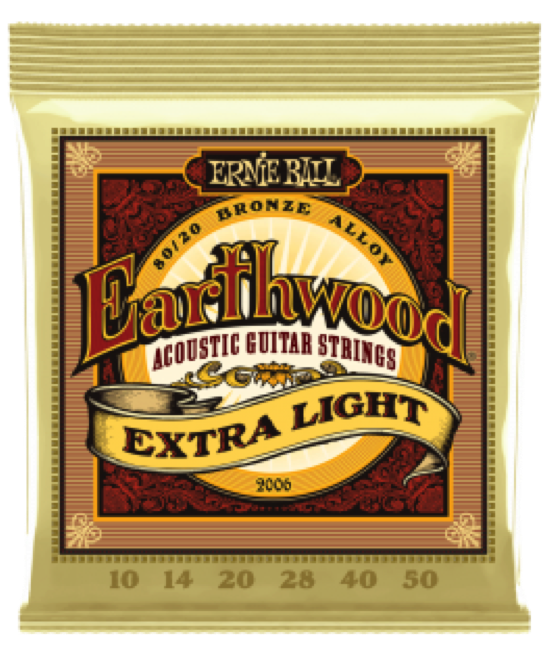 The Ernie Ball Earthwood 80-20 Bronze are phosphor bronze acoustic guitar strings. 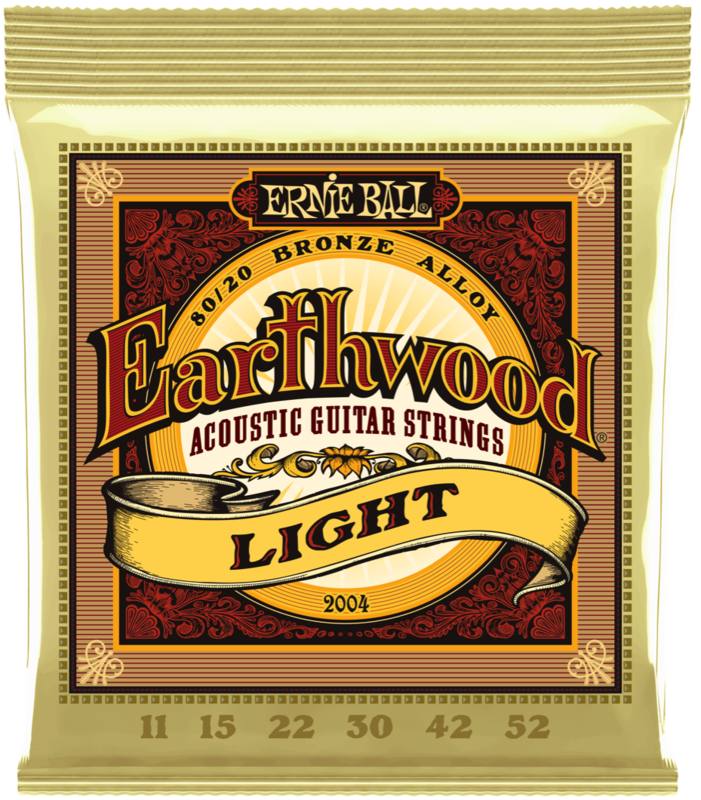 Earthwood 80/20’s are made from 80% copper, and 20% zinc wire wrapped around hex shaped tin plated steel core wire. The most popular acoustic guitar strings from Ernie Ball provide a crisp, ringing sound with pleasing overtones. Ernie Ball is the pioneer of rock and roll guitar strings. Setting the standard for the industry has enabled Slinky strings to become the world’s top selling brand. Jimmy Page, Eric Clapton, Steve Vai, and Slash are among the long list of Slinky players. Made from 80% copper, 20% zinc wire wrapped around hex shaped tin-plated steel core wire. These popular acoustic guitar strings provide a crisp, ringing sound with pleasing overtones. 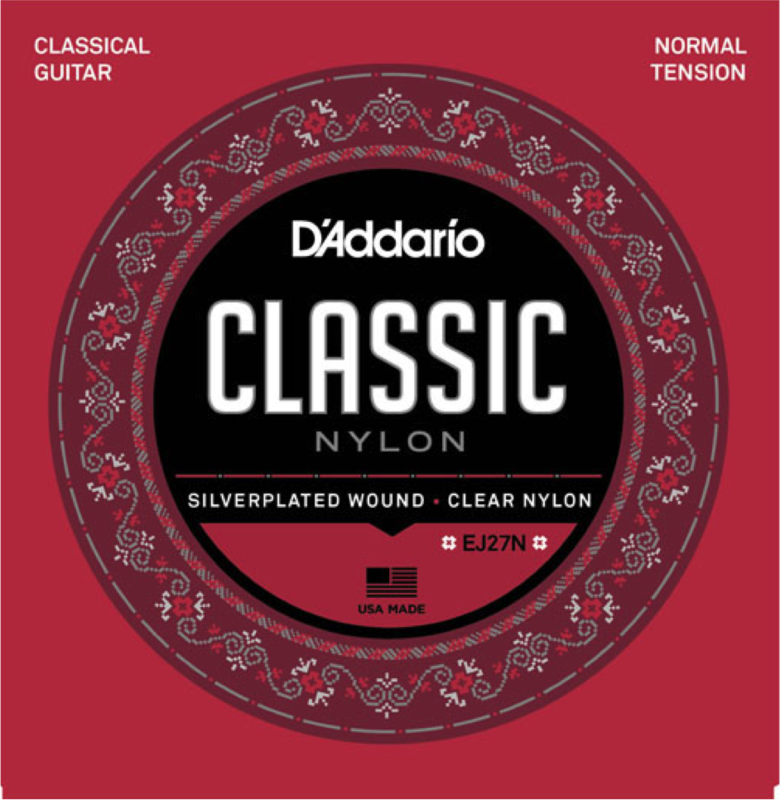 D’Addario’s EJ27N Classic Nylon guitar strings are great for beginners, students and professionals alike. This normal tension set contains 3 clear nylon trebles and 3 silver-plated copper wound basses for the optimal balance of warm and projecting, long lasting tone. D’Addario’s premium uncoated acoustic string set that provides a crisp and clear sound to accentuate the unique tone of your guitar. 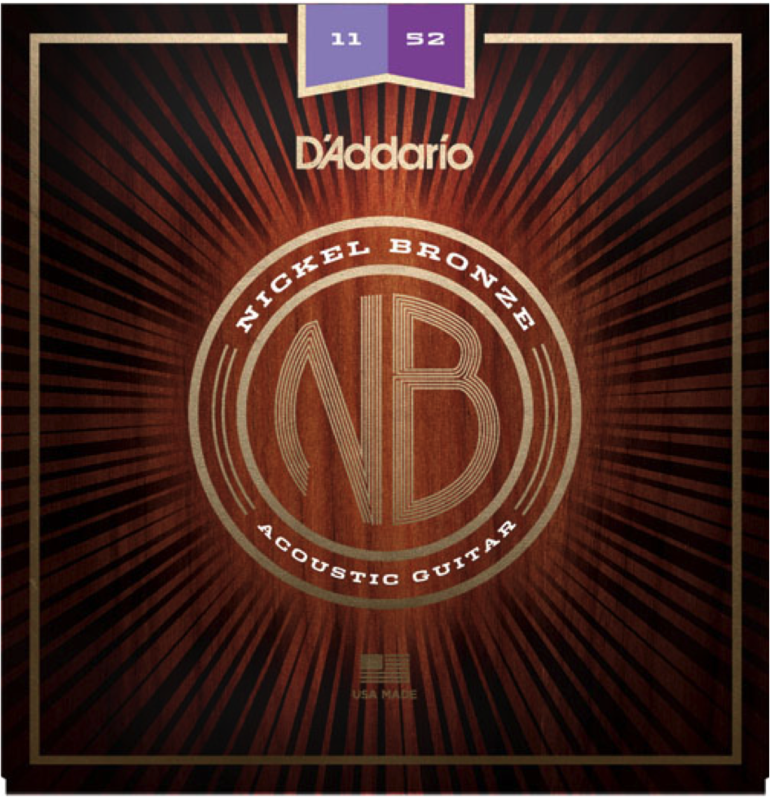 The D’Addario Nickel Bronze NB1152 delivers the ideal balance of volume, projection and comfortable playability. Nickel Bronze delivers unrivalled clarity, resonance and projection, as well as outstanding balance and harmonically rich overtones. With an 80/20 composition for brilliance, clarity, and longevity of sound. The Bronze winding alloy is ideally suited for making strings have deep, rich basses and clear, bright trebles. Martin SP strings resist breakage better than average strings. 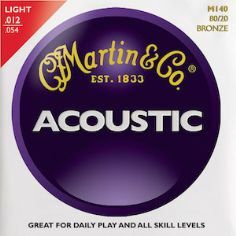 The Martin M-140 acoustic pack has high-quality strings for daily use. Core and wrap wires meet strict requirements to make the grade. Martin guitar strings are wound to precise specifications. Bronze alloy for brilliance and long life. Great price, studio-quality performance. Due to the development of an industry leading ultra-high quality steel core, Martin SP strings resist breakage better than average strings. In addition, both the core wires and the plain strings are plated with a smooth, acoustic bronze finish. Bronze alloy for brilliance and long life. Great price for superior tonal quality. Electric guitar strings – balanced tension sets allow for evenly balanced bending, strumming, fretting, picking, and plucking. Plain Steel – E:11, B:15, G:19. Nickel Wound – D:28, A:37, E:50. 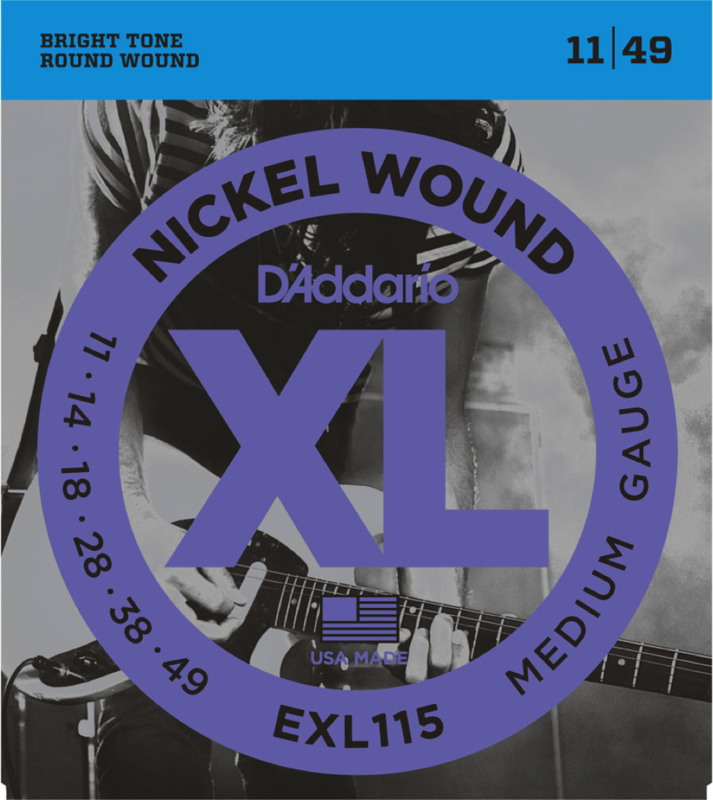 D’Addario’s most popular electric guitar strings – XL Nickel Wound – are precision wound with nickel plated steel onto a carefully drawn, hexagonally shaped, high carbon steel core. The result – strings with long lasting, distinctive bright tone and excellent intonation, is ideal for the widest variety of guitars and musical styles. 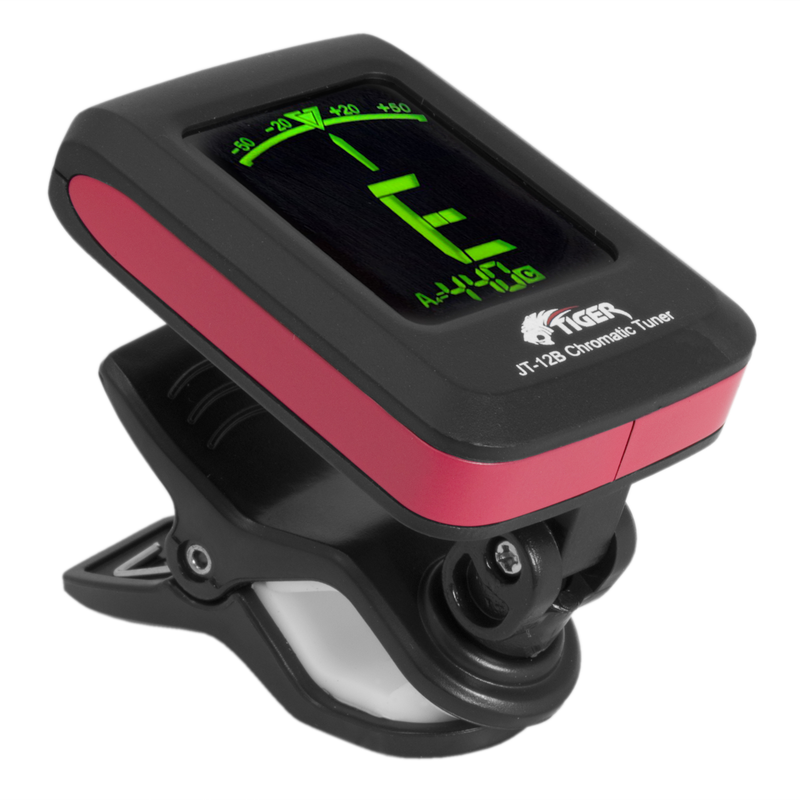 Hybrid gauges optimized for down tuning. Round wound with nickelplated steel for distinctive bright tone. Super light gauges for maximum flexibility and biting tone. Round wound with nickelplated steel for distinctive bright tone. Environmentally friendly, corrosion resistant packaging for strings that are always fresh. Ernie Ball is the pioneer of Rock and Roll guitar strings. Since setting the industry standard for electric strings, the list of Slinky users has grown to include the likes of Jimmy Page, Eric Clapton, Steve Vai and Slash. Wound strings are made from nickel plated steel wire wrapped around tin plated hex shaped steel core wire. Plain strings are made of specially tempered tin plated high carbon steel. Made from stainless steel wire wrapped around tin plated hex shaped steel core wire. These guitar strings provide brighter sound and extra string life. 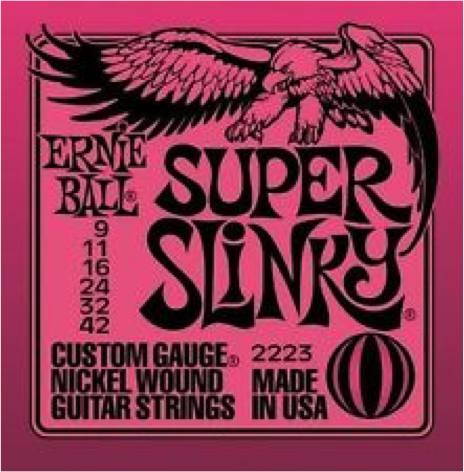 Ernie Ball Regular Slinky Electric Guitar Strings are precision manufactured to the highest standards and most exacting specs to assure consistency, optimum performance, and long life. 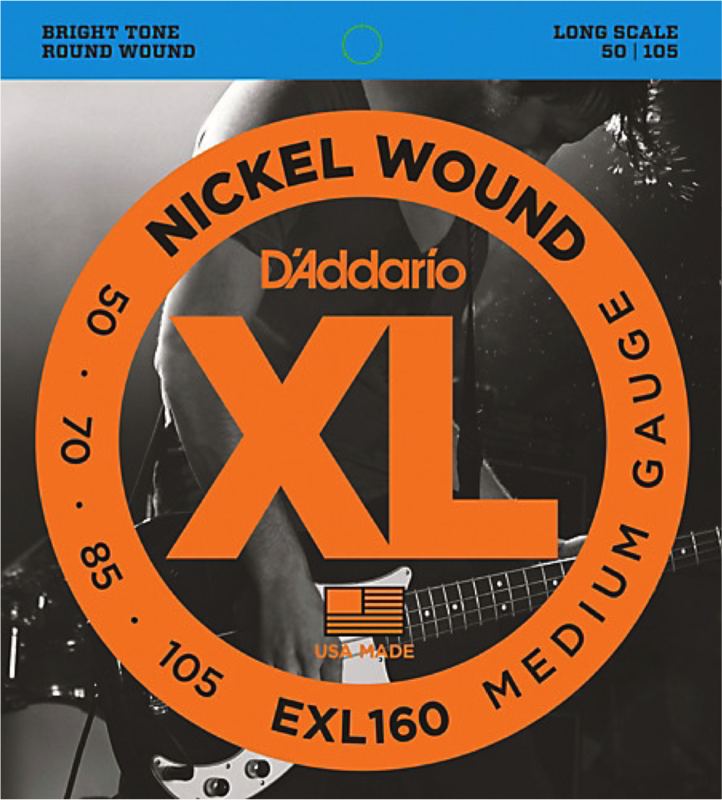 D’Addario XL Nickel Electric Bass strings are world-renowned as “The Player’s Choice” amongst bass players of all genres and styles. 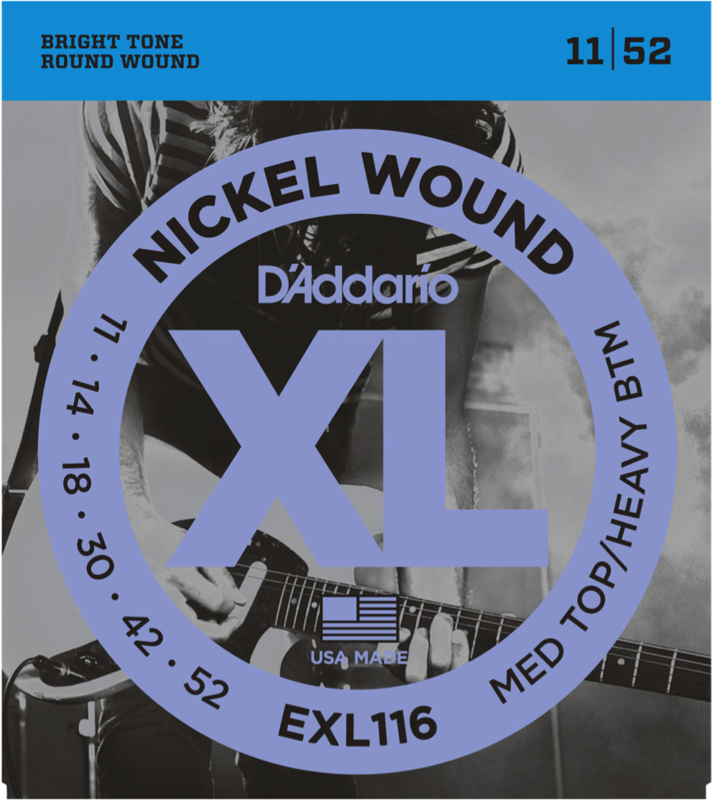 All XL strings are precision wound on our exclusive computer-controlled machines, ensuring each string has excellent into nation, clear fundamentals, and unparalleled consistency. 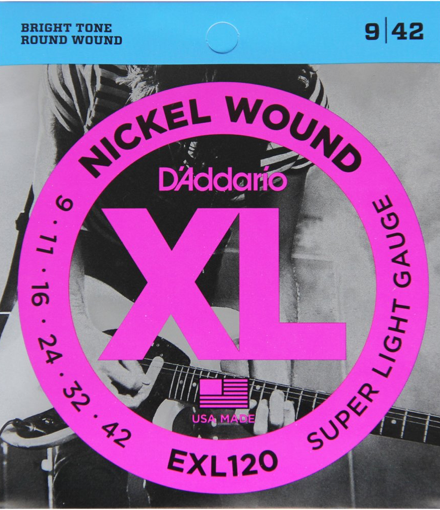 The nickel plated steel wrap wire is known for it’s distinctive bright tone and excellent intonation and delivers a universally appealing tone for all playing styles. 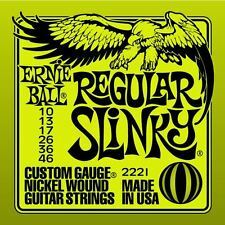 Ernie Ball 2832 Regular Slinky bass strings are round-wound for maximum clarity and serious punch. 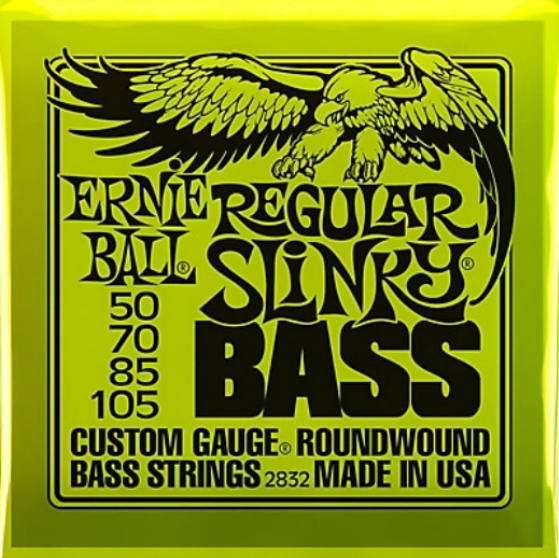 The list of endorsers for Ernie Ball Slinky bass strings reads like a who’s who of modern rock bass. Made in the USA with specially formulated alloys for long life and maximum vibrancy. 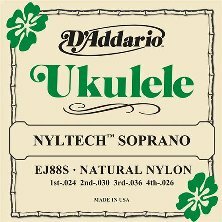 For use with all soprano ukuleles, each string within this set is made from D’Addario’s exclusive Nyltech material and optimized for GCEA tuning. Nyltech strings are an exclusive combination of materials designed to deliver an optimal combination of warm, yet punchy tone, comfortable playability, precise intonation and tuning stability not found in other ukulele strings. Giving you that warm, traditional ukulele tone. 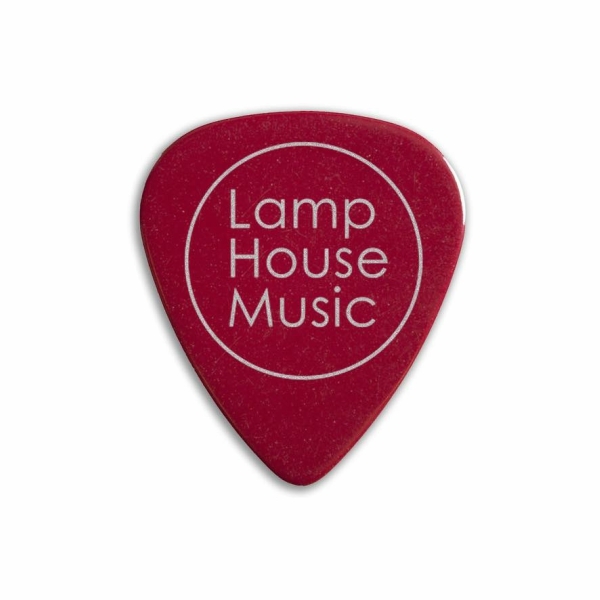 These ultra-cool plectrums featuring your favourite Rehearsal Studio are made from celluloid (as are classic Fender picks). Black plectrums are heavy gauge 1.00mm, which best lends itself to rock rhythm playing, soloing styles and bass playing. Heavy picks provide extra warmth, control and volume to your sound. Blood red plectrums are medium gauge 0.71mm, which is an ideal starting point if as a beginner, you are unsure about the weight of gauge you prefer. Perfect for acoustic guitar picking and strumming. Highly accurate and extremely easy to use for guitarists of any level. Currently one of the smallest tuners on the market, this clip-on tuner is extremely versatile with four instrument settings which allow you to quickly and efficiently tune your guitar, bass, violin or ukulele. In addition to its four instrument setting, it also has a standard chromatic setting so you can tune most instruments. The JT-12B picks up vibrations through the clip and will give you an accurate reading on the digital screen. This gives you the ability to tune your instrument in noisy environments without the concern of other sounds affecting your reading. These straps are fitted with 3 plectrum holders which can store your guitar picks so you don’t have to worry about misplacing them. 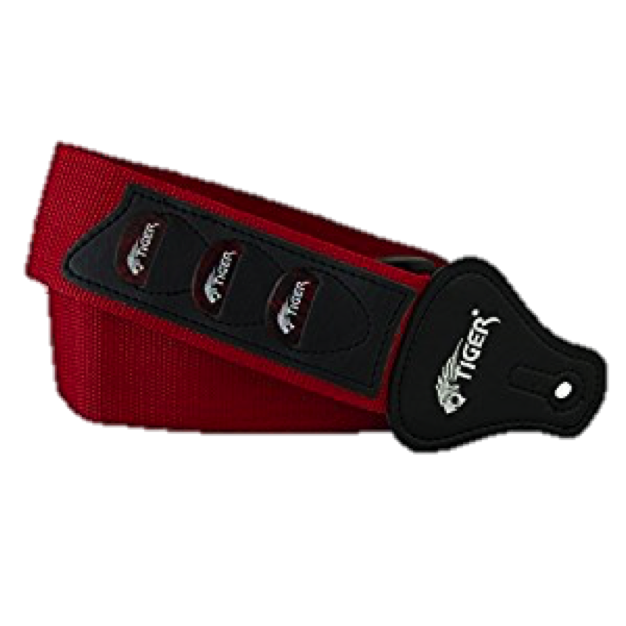 Manufactured with thick, strong nylon, these straps are long-lasting and durable. Constructed with leather style ends you can rest assured that these straps will not mark your guitar. 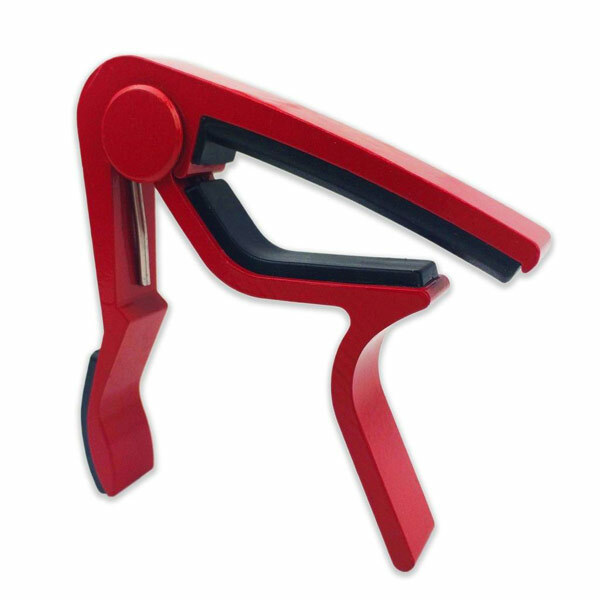 Suitable for children and adults with its adjustable length, it also comes with a shoelace so you can use it with acoustic, classical, electric or bass guitars. 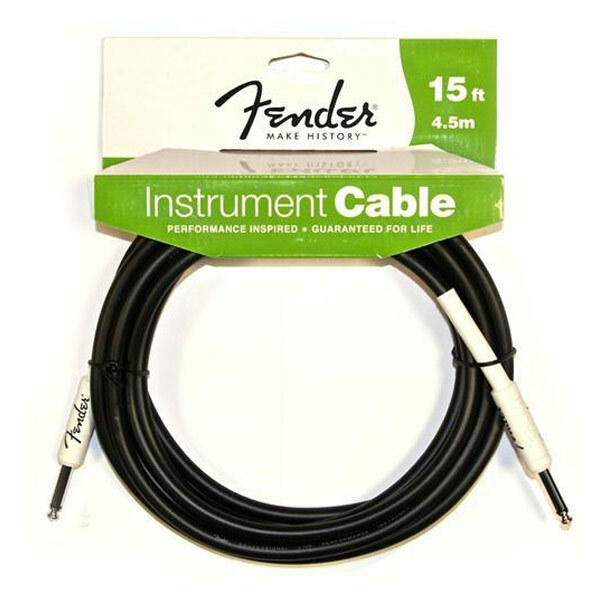 Fender’s Instrument Performance Cable range are great value for money, with the reliability and quality you would expect of Fender. Extremely pliable to eliminate kinking, with commercial-grade jack connectors with 90% copper coverage shield. 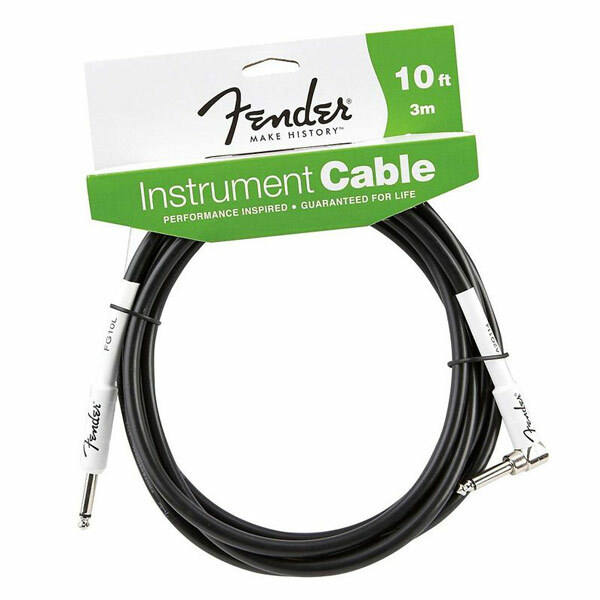 Perfect for the house or as backup cables in your gig bag. Extra thick, 8mm in diameter cables in a black PVC jacket to reduce handling noise. 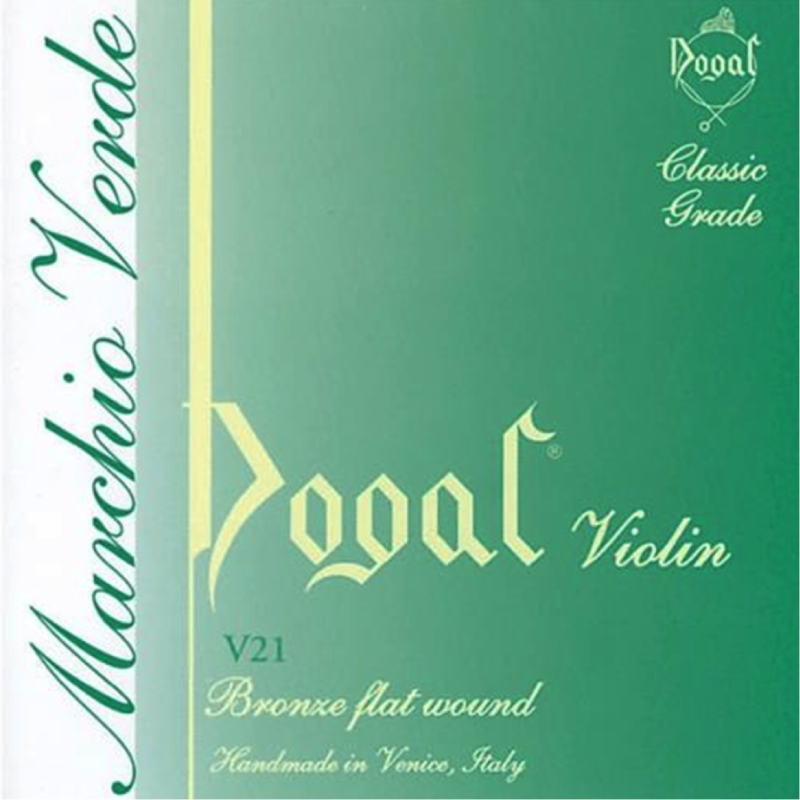 Dogal Green Label bronze wound strings are widely used by student players and recommended by teachers. Great sound and value. The production of the first Dogal violin strings began in 1950, the steel core of each string was covered with a series of windings, the last of which – a breakthrough at the time – was flat-sectioned, thereby offering a smooth surface to the touch. The resulting interaction with the bowhair gave a sweet, quality sound with considerable volume. Even though over 40 years have passed since the founding of the company, most of the production process is still done by hand, with minimal tolerances over the full length of each string, as only the masterful hands of skilled string makers can produce. 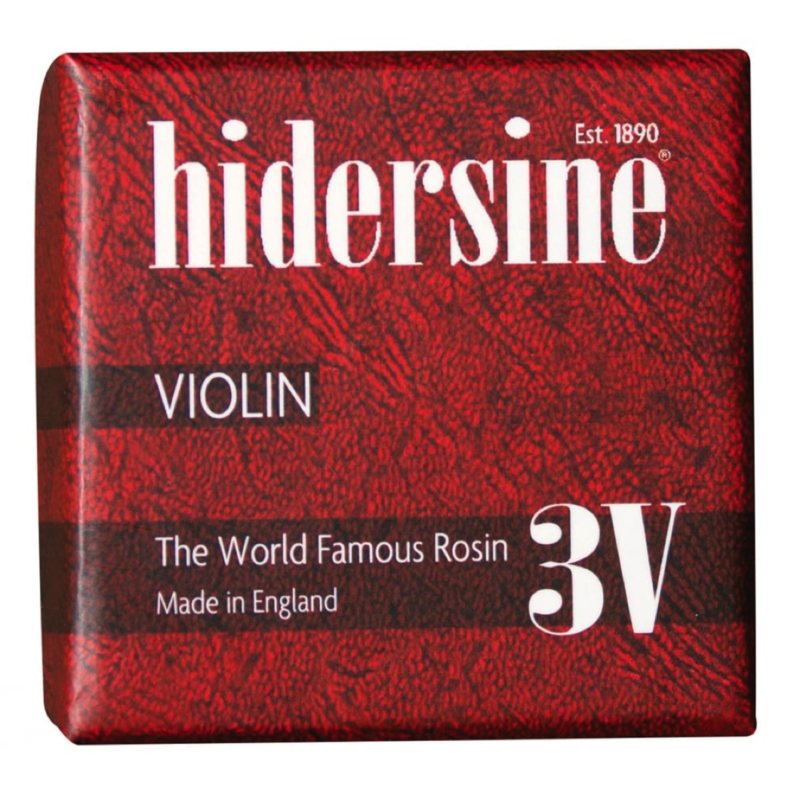 A high quality, dark Violin rosin suppied in a cloth and protective metal tin. Suitable for all players. In 1876, Dr. Hider – a Swiss chemist and violinist working in London – became frustrated with the lack of decent rosins available. Subsequently, combining his knowledge of chemistry and music, he decided to develop his own. So Hidersine Rosin was born. The range is still manufactured to the same exacting standards and specific recipe Dr. Hider specified over 130 years ago. 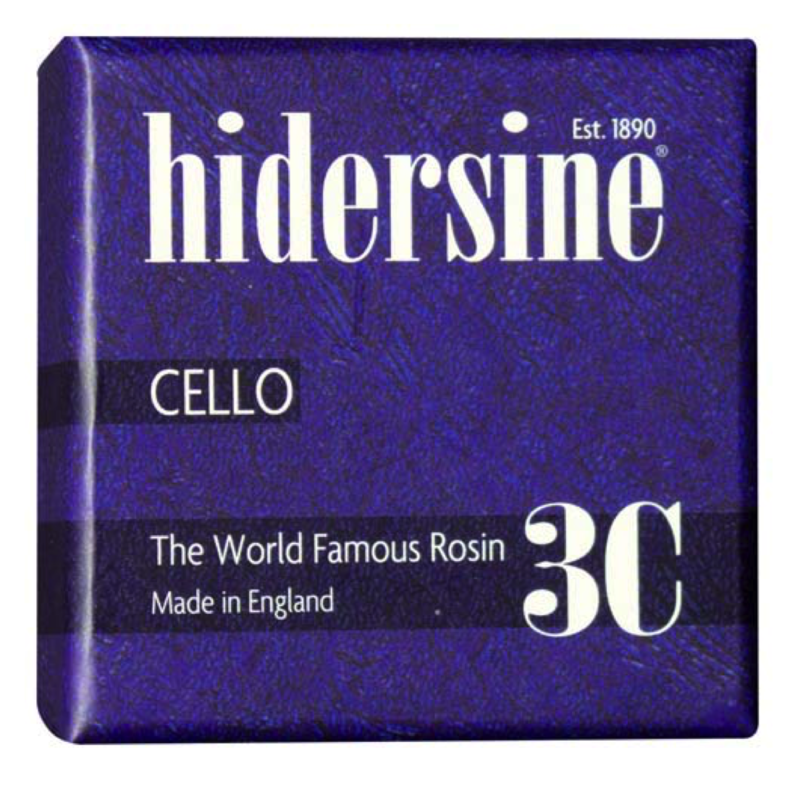 A high quality, dark cello rosin suppied in a cloth and protective metal tin. Suitable for all players. 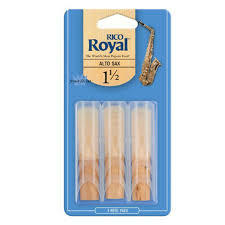 Designed for a wide variety of playing situations these are high-qulaity reeds available for both clarinet and saxophone players. Made from premium grade cane for consistent response and playability, french filed to add clarity to the tone and make soft attacks easier. 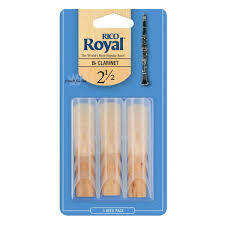 These reeds are priced affordably to meet the needs of professionals and students. Made from premium grade cane for consistent response and playability, french filed for flexibility and fast response, to add clarity to the tone and to make soft attacks easier. Fit for all drums and all drummers, ideal for beginners. Cool designs and available in various colours. 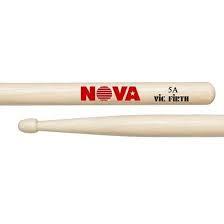 A superb drumstick made of hickory with a wooden tip, offering great value for money. 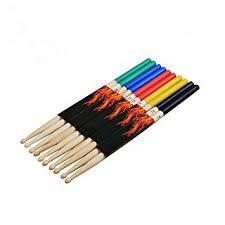 Each pair is weight-sorted and tone-paired using Vic Firth technology. Light and fast, ideal for jazz, orchestral and pit work amongst other drumming styles.